Uma Thurman's New Look: Makeup or Surgery? Browse: Home » Uma Thurman’s New Look: Makeup or Surgery? 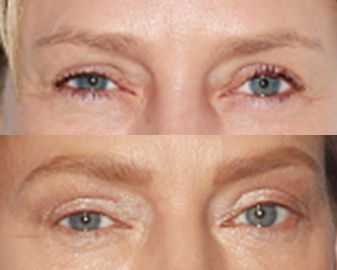 Uma Thurman’s New Look: Makeup or Surgery? Okay… I want this discussion to be as TASTEFUL as possible. 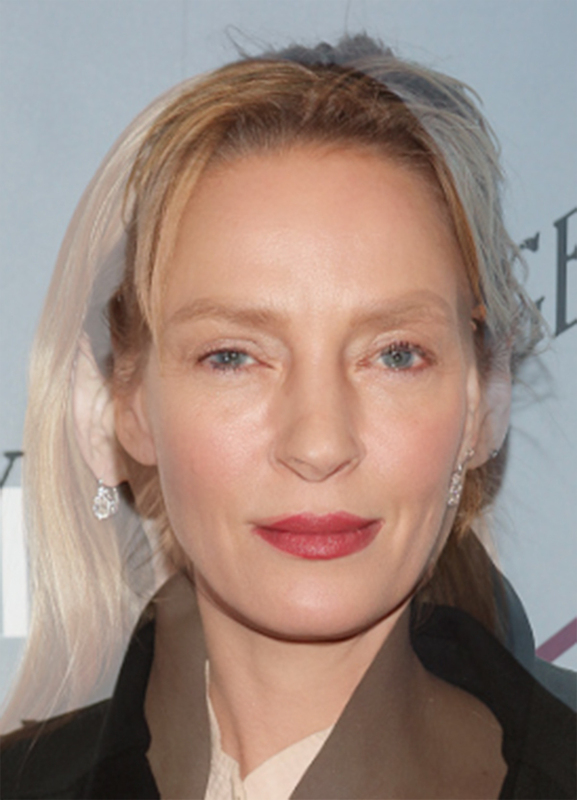 My Facebook timeline has been absolutely flooded the past few days with gossip rag headlines about Uma Thurman’s “new look.” She was photographed on the red carpet at the “The Slap” premier party at New York’s New Museum on February 9th looking a little… different. Now, I want to be clear about something. I consider myself a feminist, in belief and in practice. I believe it is horrible to make judgements on what women decide to do with their own bodies. Let me state for the record: I do not know if Uma has or has not gone under the knife, and if she did, that is completely her choice and I support her without judgement. That being said, as a makeup artist, I am always analyzing faces. Especially celebrity faces… as they make a career of putting THEIR face, in MY face! But beyond that, I am always in search of the age-old question of my profession: Can a makeup application be as good as plastic surgery? That is the spirit in which I’m discussing Uma’s new look. Now… I’m not going to sit at this keyboard and lie. At first glance, I was kind of dumbstruck. I am a huge Uma fan, and somewhat follow her career, and had never seen her looking this way. I don’t mean to imply that she looked bad, by any means. She just looked… different. The first thing that struck me was her complexion. Momma is noticeably tanner than we’ve ever seen her. Also, NO BANGS! She was giving us a complete, 180 degree view of her money-maker. So, I think those two things contributed to my initial surprise. Upon further inspection, I noticed that something was still not… familiar… about her face. So I decided to be scientific. Now, I’m not Bill Nye the Science Guy scientific – I’m more like 10th grade science fair scientific. I wanted to know… had her actual face changed? So I proceeded to drag the two pictures of her into Photoshop, overlap them, then lower the opacity on the top image to 50%, and see if one of these things is not like the other. Now, aside from the mildly skewed perspective of each shot (as the two pictures are not shot from the EXACT same angle, but they are close) her face is pretty much exactly the same! When the two images are scaled down to match their size, her features, like her eyes, nose, mouth, and hairline, are all sitting at the exact same place, and at the exact same angles. This rules out a face lift or nose job. Now, what I DID find to be different are her brows and eye-lid. Aside from her brows being filled in more than usual, the arch appears to sit higher than in previous pictures, and her lid appears to be more visible. Unless her makeup artist is a master magician and special f/x artist, I doubt she is hiding a set of Mark Traynor or Art Harding facelift tape-and-tassle kits! -Heavily-filled brow (which leaves us pondering if the higher arch is drawn in or surgically added. I can’t call it for sure, but I’m going to guess that her new look is the work of makeup and photography angles… and perhaps a little weight loss. I don’t believe we are seeing surgery here. And if we are, the difference is so slight to her physical features, I’d say she wasted her money. What do you think? Is this just makeup and angles making her look different? Or something a little more permanent? Chime-in down in the comments. BE TASTEFUL. BE CONSIDERATE. BE KIND.